We love catering weddings- they are our specialty and we cater each one to be delicious, unique and unforgettable! Paella for a wedding is a romantic feast of amazing food; an entertaining cooking show for happy guests and an unforgettable experience for everyone - your guests will be raving and thanking you for days! While your wedding meal is our primary focus, we also understand that it is one among many details you have to plan for your special day. With that in mind, we will work with you to plan the perfect menu so you can enjoy your wedding day and please the palate of every guest on your list. Professional service and many smiles on your special day! Time permitting, a short video and food pictures to share with family and friends (similar to video below). This video will be at no additional cost to you. August 29, 2015 - Beach Wedding. Gloucester, MA. Heather and Juan. We believe weddings are a personal experience and our initial approach is to get to know each couple on a personal level. 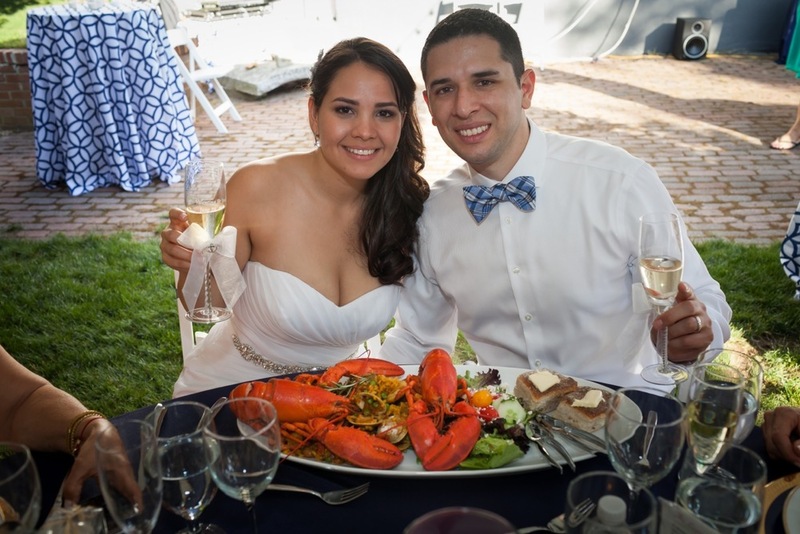 We like to think of this experience as our "first date" with the groom and bride, where we get to romance them with an amazing tasting experience complete with a paella, appetizers, dessert and wine. The tasting also offers us the chance to get to know them personally and answer any questions they may have about our product and services and it also gives us the chance to tell them more about their wedding day catering experience. Festive ambiance with Spanish music, lighting and lively conversation - make sure to bring your appetite! For anyone looking for a unique dining experience, Sensational Paella Catering will be happy to host a private dinner party of up to six people at chef's Julian's private table. He will create a personal menu for you and your guests. Please call 617-285-6968 for details and to schedule your next private dining experience.